As Toronto is viewed as the largest city in Canada and regarded as one of the most multicultural cities in the world, it’s easy to see why millions of tourists travel to the city every year. With a wide array of tasty cuisines and a thriving art scene, here are 10 reasons why you need to put Toronto next on your must-go-to destinations. Those into their arts and crafts can be sure they’re coming to the right place when it comes to visiting Toronto. With several major art museums dotted across the city (such as the Art Gallery of Ontario), visitors can view some of the most fantastic exhibitions in the world. There are hundreds of art exhibitions and smaller galleries that are housed in popular districts such as Queens East, Ossington, and the Distillery District. If you’re a night owl, you may be interested in visiting Nuit Balance (an all-nighter arts festival that takes in Toronto from night until day). If you’re a film fanatic, Toronto is waiting for you! The TIFF (Toronto International Film Festival) runs annually and is regarded as the second most important festival after Cannes. The festival has been running for over 40 years and once it gets underway in September, you can expect to spot some of the world’s biggest celebrities and actors in Toronto. The festival begins on the Thursday after Labour Day and runs for 11 consecutive days. Bear in mind that flight and accommodation prices are likely to be much higher during the festival, so ensure you book well in advance. Toronto prides itself on its warm and friendly atmosphere. If you are a first-time visitor, it can feel a little daunting not knowing how to get around the city. However, with many of the locals said to be welcoming and helpful, there is always someone around to point you in the right direction should you get lost. Locals will also be able to give you useful advice on what types of attractions to check out and where to go for the best cuisine. Some of the top museums in Toronto include the Art Gallery of Ontario and the Royal Ontario Museum. However, there are alternative hubs that you should check out, such as the Bata Shoe Museum or the Hockey Hall of Fame. If you’re a big fan of museums, you won’t want to miss out on visiting ROM Friday Night Live. The event is held weekly between May and June and features some of the worlds biggest DJs and indie artists, accompanied by fantastic food and drink. Make sure you are suited and booted for the occasion, as you immerse yourself in the galleries before hitting the dance floor in a museum like no other. If you find the hustle and bustle of Toronto a bit too much, there are short ferry rides that you can take, which will transport you to the Toronto Islands. If biking, hiking and going for a picnic are more your thing, the Toronto Islands may be the perfect option for you. A day excursion spent walking on sandy beaches and getting away from the busy inner-city life can be a great way to see Toronto from a new perspective. Once the sun goes down in the city, you will have the perfect view of the skyline, making it one of the most popular attractions for tourists. 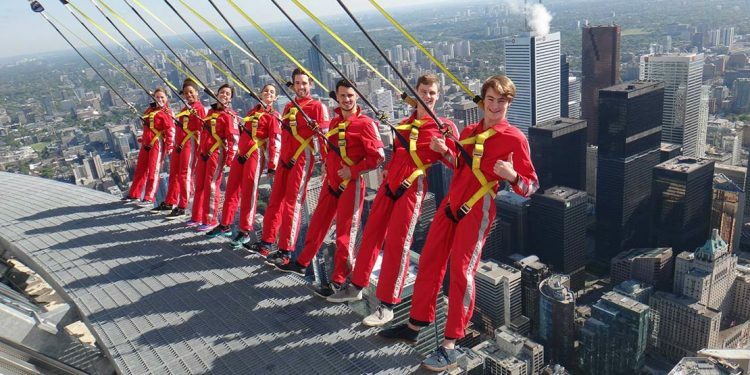 Regarded as the planet’s highest hands-free walk and located at the top of CN Towers, Edgewalk is certainly not for the faint-hearted. If you like to think of yourself as an adrenaline junkie, this attraction is perfect for you. The experience is one of a kind and will see you standing on one of the Seven Wonders of the Modern World. Edgewalk is Toronto’s most popular attraction. It allows visitors to enjoy the glorious cityscape, as well as viewing Lake Ontario. If you are not put off by heights, be sure to book yourself a slot at Edgewalk. However, as the attraction is so popular, it’s best to book in advance to avoid disappointment. In the summer months, there are several scenic spots that display free outdoor films across the city. Simply arm yourself with a towel or a blanket, some snacks, and sit back, relax, and enjoy a movie as the sun goes down. There are several outdoor locations that play movies such as David Pecault Square and Sugar Beach. Before you visit, have an idea of what types of films are playing so you can find something for you and your travel partners to enjoy. If retail therapy is what you’re after, Toronto has it all and more. You will find that prices in Toronto are very reasonable compared to other cities and countries, however, make sure to watch out for tax, as you’ll need to add an additional 13% price to most items. Toronto is a fantastic shopping city with a wide array of clothing stores and boutiques to check out. Make sure that you factor in a trip to the Toronto Eaton Centre that features over 250 retailers. This mall is one of the busiest in North America and a favorite spot for tourists and locals. There are shops to suit every budget, so whether you’re looking for a small souvenir or wanting a bit of luxury, you are sure to find it on the streets of Toronto. 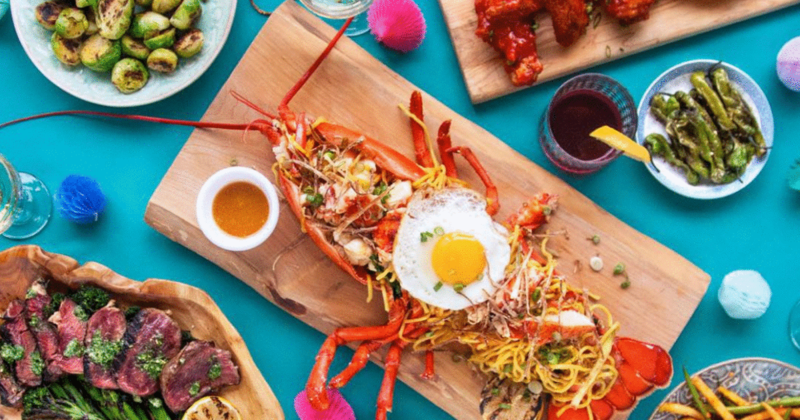 As Toronto is one of the most multicultural cities in the world, this means that you can expect to find foods from across the globe at your fingertips. No matter your budget, the city is full of cafes, bars, and restaurants that provide some of the tastiest cuisines around. There are also several food markets that offer homecooked food, ensuring there is always something new and exciting to try out when in Toronto. Toronto is in the northeastern region of North America, which means that the city is easily accessible to and from Boston, Washington, Chicago, Montreal, and New York. Toronto’s Billy Bishop’s Airport is conveniently located in Downtown Toronto. If you prefer to fly, be sure to book in advance when searching for flights to Toronto. Companies like Porter Airlines offer direct and affordable flights and you can find flights to Toronto here. Once you have landed in Downtown Toronto, you are sure to be at ease thanks to the easily accessible transport system. With train and buses operating frequently throughout the city and located near many popular attractions, you can get around Toronto without too much hassle. It’s best to book accommodation close to a train or bus link, so you don’t have to carry your luggage around for long. Whether you’re a foodie looking for something new to taste, a shopaholic in need of some retail therapy, or you want to immerse yourself in the rich heritage and culture, Toronto appeals to all walks of life. Also, the time of year you visit Toronto could save you a fortune on flights and accommodation, so it’s always best to book as early as you can.